One of my main reasons to wanting to open a yoga studio was to have a platform and an opportunity to make a contribution and help out local charities, sports teams, and causes that are close to my heart. Yoga Barre classes will be held on Fridays at 7:30pm and Sundays at 6:00pm. Lets get Downdog! Charity Yoga Class. Special Yoga Class with adoptable puppies and dogs! To register for these classes, you may do so online, on the app, or in studio! The Yoga Barre is NOW OPEN! First time at our Studio and just want to try one class? Want to check us out for a month? – We have a intro month special of 30 days (unlimited barre, spin, and yoga classes!) for only $50.00! Can’t commit to a full month but still want a good deal on classes? Blend all together, top with coconut if that’s what you like and enjoy! See? Super easy! This is definitely my ‘go to’ when I’ve been super busy and haven’t had the time to eat my daily dose of veggies. Want it not as thick? Thin it out with water. Want it a little more chill? Add ice. Kale out of season and super expensive? Spinach is also a great substitute! Use whatever “milk” you like! I used coconut cause I love coconut but really the option is completely yours! Winter is not over yet! Keep warm with two interesting tea blends. Like most Ukrainian girls, I have a weird affinity for beets. I love them in everything! Salads, smoothies, roasted, and of course in my favourite soup: Borcht. I also enjoy them in teas. They give a nice pink hue to the tea and they add an earthy flavour. Below are two tea blends that I have created for myself – feel free to try them out! 1.Thinly slice pre-cooked beets (either boiled or baked) and place on a baking sheet. 2. Put in oven and for about 8 hours, flip them over every 45 mins. 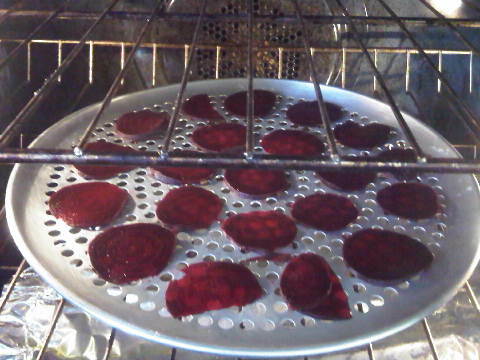 When beets can be easily crumbled or crushed then remove baking sheet from oven and let cool. 3. Once cool, place in a ziplock bag and beat with a rolling pin/wooden spoon/bottom of shoe/something heavy until beets are in smaller pieces. 4. Use beets in either one of the two blends that I created. You can buy rooibos and gogi berries at a health food store. I bought mine at Vita Health (http://www.vitahealthstores.ca/) in Winnipeg. The apple can be dried the same way at the beets (but have to be left in the oven for a longer time, around 10 hours) I buy dates and then dice them and dry them out in the oven a little as well. To toast walnuts: Place on baking sheet, put oven on broil and place sheet in the oven for about 3 mins, making SURE to keep an eye so that they do not burn! You can buy green rooibos and yerba mate at a health food store (like Vita Health). 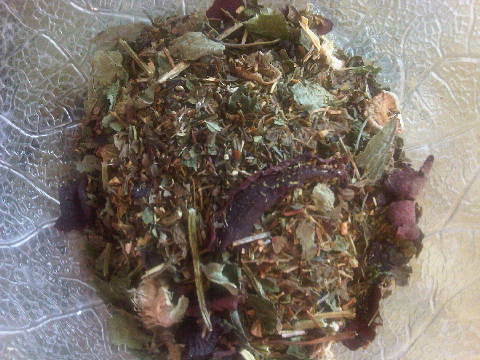 I grow my own herbs so this was a perfect time to use my dried mint and lemon balm that I harvested in the fall. Making your own tea blend isn’t super hard once you know where to get all the basic ingredients. If you happen to create your own, drop me a line (or comment here) to let me know what you did. I would love to try it out! We are so excited to announce that we have 85% of our website up for The Yoga Barre! The only thing we have left to do is set up our scheduling system. Once that is up you will be able to register for our classes and view our entire schedule! Another announcement will be made once we have our online scheduler up and running. In the meantime, we want to hear from YOU! We have 18 amazing classes to choose from at The Yoga Barre – https://theyogabarrewpg.com/class-descriptions/. We also want to hear when you would come to practice at The Yoga Barre. What is your ideal class time? These simple polls are totally anonymous and will allow us to create a schedule that is for our members BY our members! Ah, Valentine’s Day Weekend. Depending on your take of Valentines it could be a day of love, appreciation, romance, expectation, dread, or even a day where you feel kind of lonely and bummed out. I personally don’t have a lot of expectations on Valentines. It’s simply been a day where I’ve felt super thankful for those who are part of my life’s journey. Its been a day where I have always wanted to show how thankful I was: whether I’ve taught a class that day and its a love related playlist followed by a simple token of appreciation for my students, kitschy valentines day cards to my friends, or a day where I’ve baked a dozen cupcakes to share with anyone I come across. It wasn’t until I started getting into yoga that I started to be more mindful of what I do in my every day life for myself. I didn’t undergo any drastic changes, but what I did do was begin to recognize and appreciate all the little things I do or can do for myself. I began to make a list of little tasks or rituals that I could do to make me feel loved and cared for. Those became my ‘go to’ picker uppers to do when my energy is low or when I am just having a shady day. Below is my ‘go to’ list of things that can brighten my day and make me feel an appreciation for myself and my life. If you can relate to any of the ideas on my list feel free to do one on Valentine’s Day – or on any day for that matter! NOTE: go to list subject to change with the seasons, buuuut its -40 outside right now so indoor activities it is!. Essential Oils – pretty much an instant love connection for me, makes me happy and relaxed. My personal favourites are Saje diffuser and the Refresh oil. Yoga – If I have time I will venture out and participate in a yoga class, but in a pinch its nice to simply disconnect, light some candles, play some music and take 30 to 45 mins to just do my favourite yoga postures. What brightens your day? Share below! I would love to hear!